PUTRAJAYA, 16 May – Universiti Kuala Lumpur Malaysia France Institute (UniKL MFI) and Universiti Kuala Lumpur Malaysian Institute of Information Technology (UniKL MIIT )today received the Certificate of Self-Accreditation Status awarded by the Malaysian Qualification Agency (MQA) which was presented by the Honourable Minister of Higher Education, YB Datuk Seri Idris Jusoh. Receiving the award was Prof. Mazliham Mohd Su’ud, UniKL, UniKL CEO and President accompanied by the top management members of UniKL. 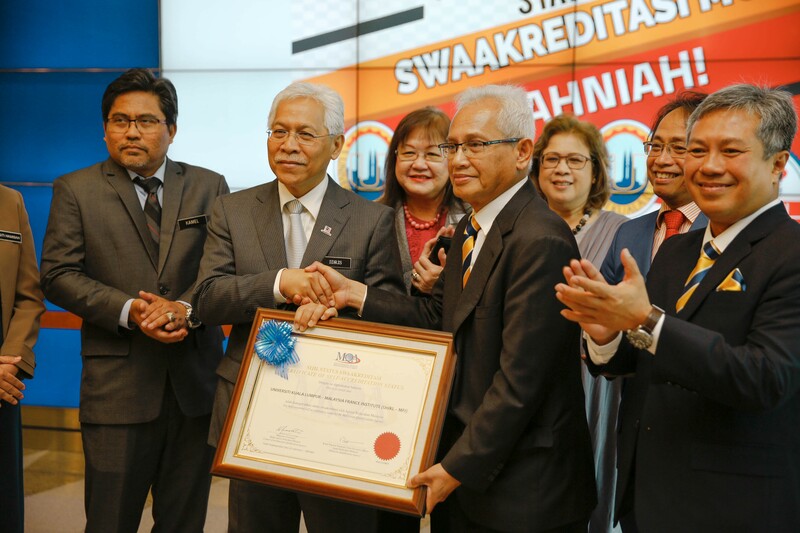 The self-accreditation status is an academic autonomy which allows UniKL as a higher education provider to accredit its own programmes based on the standards set by MQA and MOHE. This is a recognition to UniKL’s robust internal quality system and remarkable achievement in the local and global HTVET education environment. Also present were Deputy Minister Dr Mary Yap Kain Ching, Chairman of MQA, Tan Sri Dr Abu Hassan Othman, Secretary General of the Ministry, Tan Sri Dr Noorul Ainur Mohd Nur, MGQ CEO Datuk Prof Dr Rujhan Mustafa, as well as UniKL Deputy Directors Prof. Dato’ Dr Azanam Shah Hashim (Academic and Technology), Datuk Salmah Hayati (University Development and Sustainability), Prof. Dato’ Dr Khairanum Subari (Student Development & Campus Lifestyle) and Prof.Dato’ Ahmad Zahir Mokhtar (IIIP). Having tug-of-war with Orang Asli children.